The Residential Building in Neklanova, Prague, designed and built between 1913 and 1914 by the architect Josef Chochol (1880-1956) has this month a moment to shine, appropriately, as it was inspired by the idea of the diamond. This collective housing unit features a distinctive design with a strong layout reminiscent of some of the projects that would be proposed for the American skyscrapers of the 1920’s and precursor of the dramatic aesthetics of German expressionism. Its majestic corner column is characterised by its slenderness and evokes the late medieval diamond vault through crystalline forms. The main cornice reveals an exceptionally ornamental character and, Chochol would argue that these pieces that „appear to be ornamental are so necessary in the total organism of the work that under no circumstances can it be extracted altogether“, revealing Vitruvian teachings. The general layout of the façade, of classicist inspiration, presents a clear structural grid. The built-in balconies suggest a spatial dimension characteristic of Cubism, reinforcing the contrast between light and shadow and marking the points where the surface of the façade is spatially fractured. The interpretation that Czech architects gave to Cubism led it in a different direction than the metaphysical reality that both Picasso and Braque sought in painting. Czech Cubism was more interested in the sculptural qualities of matter and the way in which this is influenced by human action. According to Pavel Janàk (1881-1956), theorist of the Czech Cubist movement, the most perfect embodiment of the struggle between human spirit and matter would be the pyramid, the form that de- materializes towards the top and a powerful symbol of the conquer of gravity. Thus, the matter or architectural mass symbolised by the orthogonal monolith was understood as a passive or dead substance and it is the artist’s task, through his spirit, to invest action in the substance and reformulate it (to give it a form). Hence, the act of architectural creation should be understood as spiritual, even if the creator might wish to destroy the substance with which he works, as part of a process that seeks to create another existence for the matter he wishes to transform. 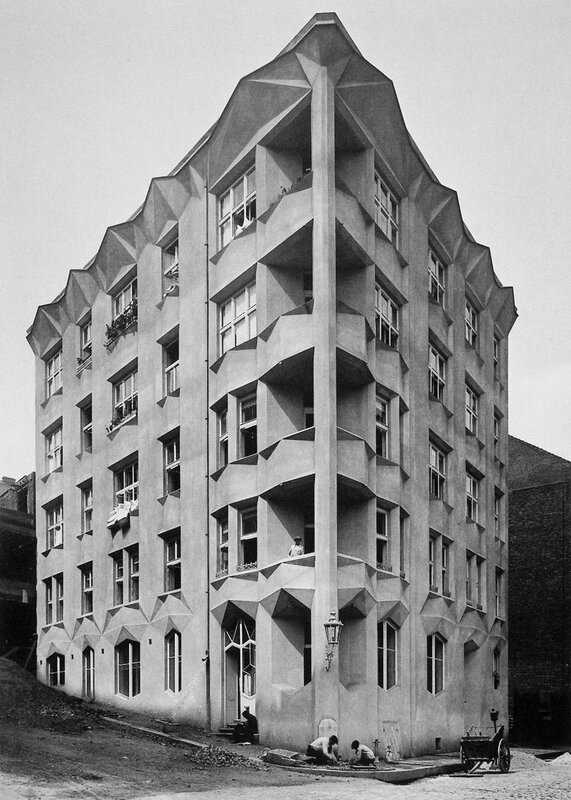 Besides its abstract theoretical and philosophical concerns, Cubist architectural forms also resulted from the influence of more practical ideas such as the appearance of the motion picture (black and white cinema), contemporary studies on perception and from scientific findings on the optical effect of the play of light and shadow on facades. Janak’s concept of frontality in the perception of objects was materialised by Czech architects, for example in Neklanova, in the composition of facades which have several frontal and lateral views at the same time. There was a great concern in studying the architectural tradition, in order to understand the universal laws and formalisations of the discipline respecting the tradition of building. For its creators, Cubist architecture should therefore coexist harmoniously with the genius loci, being directly influenced by the architecture of Prague, in particular the Gothic (transposed to the diamond motif) and Baroque (the privilege of the facade instead of floor plan and the introduction of rhythm to express the idea of movement). The Cubist movement in architecture was developed in a short period of time, 1911-1914, but its impact was profound in the city of Prague. Its results are of great interest for the history of Architecture. Dr. Arch. Maria da Piedade Ferreira MSc. is a Portuguese architect and researcher whose curiosity and interest in Art has led to her position as a researcher and lecturer at the chair for Raumgestalt und Entwerfen at Fachbereich Architektur TU Kaiserslautern. Her work is dedicated to understanding how the body and mind experience aesthetics and how empathy can be used as a design tool to improve well-being. She explores ideas of embodied learning by incorporating techniques of Performance Art and emotion measurement to the design and construction of body-conscious objects. Her MSc thesis Cubismo Checo: Um caso único na exploração Arquitectónica das relações entre Espírito e Matéria (Faculdade de Arquitectura da Universidade de Lisboa, 2014) was dedicated to the topic of the Czech Cubist experiments of Prague.